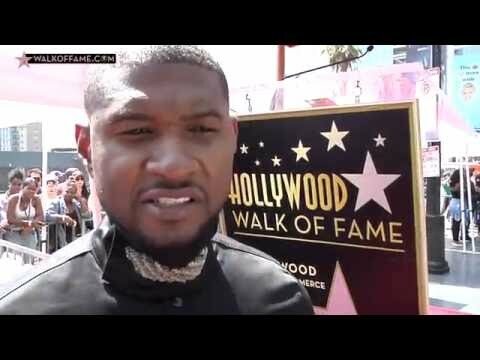 Watch as the Hollywood Chamber honors Usher with star below. The Hollywood Chamber of Commerce proudly honored Usher with the 2,588th star on the Hollywood Walk of Fame on Wednesday, September 7, 2016 at 11:30 a.m. PDT. The star in the category of Recording was dedicated at 6201 Hollywood Boulevard in front of Eastown. Helping Gubler unveil the star were Harvey Weinstein and Terry Lewis. “Usher is one of the most successful artists of our modern music world. We are proud to welcome him to the Hollywood Walk of Fame,” stated Ana Martinez, Producer of the Walk of Famer ceremonies. Usher Raymond IV was born in 1978 in Dallas, Texas raised in Chattanooga, Tennessee and later moved to Atlanta, Georgia. At the age of 12, his mother put him in local singing competitions, before catching the attention of music executive LA Reid from LaFace Records. Reid signed Usher at the young age of 14. The rest is history! Challenging himself creatively and testing musical boundaries are characteristics that have defined Usher’s career since he was first discovered twenty years ago. Usher has been ranked by the Recording Industry Assn. of America as one of the best-selling artists in American music history, having sold over 65-million albums worldwide. He has won numerous awards including eight Grammy Awards and was named the No. 1 Hot 100 artist of the 2000s Decade. Billboard named him the second most successful artist of the 2000s Decade, with his career-propelling 2004 album “Confessions” being ranked as the top solo album of the 2000s decade. Usher has attained nine Hot 100 No. 1 hits and 18 Hot 100 Top-10 singles. Some of his most popular songs include: Can U Get Wit It, Think of You, Nice & Slow, You Make Me Wanna…., You Remind me, U Got it Bad, U Don’t Have To Call and many others. Musically, Usher's new album entitled Hard II Love is set to be released on September 16th. He recently released Chains, a powerful song and interactive experience which brings attention to the social injustices of our times. Usher recently completed the filming of his role as boxer Sugar Ray Leonard in the upcoming film “Hands of Stone,” a biopic of boxer Roberto Duran played by Edgar Ramirez and costars Robert De Niro which was released in theatres August 26, 2016. In 2015, Usher finished the European leg of his world-tour entitled “The UR Experience”. He also completed two seasons as a coach on NBC’s Emmy award winning hit TV show “The Voice” where he proved his top-notch coaching capability by becoming the champion of Season 6. Realizing that with success comes responsibility, Usher founded his New Look Foundation in 1999. The organization empowers youth from impoverished areas to become leaders in their communities. In recognition of his accomplishments, he has been honored by the Boys & Girls Clubs of America, the Trumpet Foundation, Do Something, the NAACP, and as the 2010 Ford Freedom Award Scholar.